Discovered on 11th May 1936, the Dorchester hoard is one of the largest hoards found in Britain. It was found in several containers while rebuilding the Marks and Spencer store at the back of South Street in Dorchester. The last coins dated to the reign of Gallienus and so the date of disposition was around AD 257. Of the 22,121 coins sent to the British Museum, 20,748 were identified (16 denarii and 20,732 antoniniani). 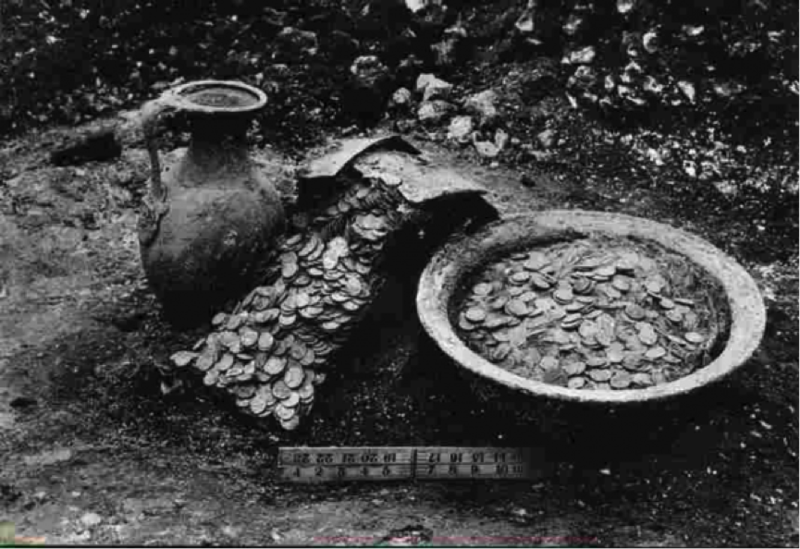 The British Museum retained 2,817 coins (some of these were detailed later by Besly and Bland in the Cunetio hoard report) and other groups of coins from the hoard were distributed to various museums around the country. So the remainder of the coins were returned and seem to have been dispersed through the trade. Many coins were offered for sale by Seabys in the 1950s when they were advertised for sale in their Numismatic Bulletin. Besly, Edward and Bland, Roger : The Cunetio Treasure, Roman Coinage of the Third Century AD, British Museum Publication, 1983. Mattingley, Harold : Numismatic Chronicle, 1939, pp. 21-61, pl. II-IV. Robertson, Anne : An Inventory of Romano-British Coin Hoards, RNS Special Publication, 2000.